If you like defense, the rugged kind, bumping up and harassing and switching and helping and rotating and working so hard at it you barely have enough energy left to make a shot, well, there’s a team for you. Perhaps it won’t last that long with the trade of Luol Deng after the early season loss to knee injury of Derrick Rose. They’re not going to get many stretches like this with losing and road weary teams. But the Bulls will ride it as long as they can as they won their fourth straight and sixth in their last eight—and second straight without Deng—to move to 16-18. The Bucks fell to 7-28. The Bulls were led by Carlos Boozer returning after missing two games with a sore knee with 19 points and 13 rebounds and Mike Dunleavy with 18 points and three of three on three-pointers. Taj Gibson added 12 points and a hard fall on his wrist and Jimmy Butler scored 10 points and had to leave the game with a bruised quad. Both said they would be fine. “No time for X-rays,” Butler said. The Bulls won despite shooting 38.7 percent, their second lowest shooting percentage in a victory. They held the Bucks to 31.8 percent shooting, the second lowest for any opponent this season. It was the fifth straight Bulls opponent failing to score 90 points and seventh of the last nine. The clankfest concluded with neither team shooting 30 percent in a fourth quarter in which the Bucks cut a 10-point lead to one, but then missed their last 11 shots and didn’t score in the last 5:09. These sorts of games generally merit the shorthand of “ugly” basketball, which really is in the eye of the beholder. Or the defender. help and then recover into position? It’s uncertain how many it will be for the Bulls now without Rose and Deng. But however many it will be, it will be because of the defense. Some teams come to mind when you watch this Bulls team, though they won’t have the same ultimate success. That fourth quarter stretch Friday when it seemed no Bulls player other than Dunleavy even wanted to shoot was reminiscent of the Sloan/Van Lier Bulls of the 1970’s and the lock down Pistons of the 1980’s. Those teams would get an eight-point lead on you with six minutes left and the game was over. Because you weren’t scoring eight points the rest of the game. It was like that after the Bucks had cut a 69-54 Bulls lead late in the third quarter to 73-72 on a Brandon Knight 20 footer with just over five minutes remaining. The Bulls offense, or what passes for it without Rose and Deng, was stranded in a forced shot zone with almost every possession resulting in the bench screaming for the shot clock about to expire and a generally wayward shot being launched. The Bulls actually came out of a timeout with 6:26 left in the game after the Bucks opened the fourth quarter on a 9-2 run (when they went four of 11 with four turnovers) and committed a 24-second violation after failing to get off a shot. Ersan Ilyasova then hit a 21-footer, Gibson answered with a rebound of a Kirk Hinrich miss and was fouled, making two free throws. Then Knight hit his jumper to get the Bucks within one point and you got the feeling the only way the Bulls were going to win this game was if they shut out Milwaukee—ha ha, a goal line stand—the rest of the game. So this is where the Bears’ defense went. Maybe they got the Bulls offense. The conclusion really was terrific. It’s certainly more fun and easier to understand offense. They don’t show highlights of defense on the ESPN top plays. Unless it’s LeBron James running back to block a shot from behind. The Bulls don’t do much of that. But what they do is get in the right position, battle over screens, contest shots all the way through the three point line and fill up the lane like a beach blanket on a sweltering day. OK, like the area around a heat lamp on an El platform. First Knight drove and ran into three Bulls at the rim and missed as that fourth quarter defensive stand began. Butler saved a ball to Boozer who was fouled and missed both free throws. Boozer was crucial in the first half with 15 points and actually finished the game as the offense dragged so badly Thibodeau brought him back instead of leaving Gibson in for the defensive close. The Bulls signed NBA veteran Cartier Martin, recently released by Atlanta, to reach the league minimum of 13 with the Deng trade and not retaining Andrew Bynum. Martin didn’t play, but he is a good three point shooter and should be helpful with this group. Of course, that’s also what we were led to believe last season with Daequan Cook. Joakim Noah then switched out to Knight, who couldn’t get around him and missed a three. Noah was suffering from a bit of the flu, though perhaps more so the loss of his close friend Deng. Noah still had eight points, 10 rebounds, seven assists, two steals, two blocks and several more interviews avoided. Noah has declined to speak with reporters since the Deng trade and no one has pushed him, recognizing the range of emotions he’s endured with all the changes. Mike Dunleavy scored 18 points, making three of three on three-pointers. (Deng’s Cavaliers won big in Utah, their second straight double digit win since the trade. In his first game Friday, Deng had 10 points in 21 minutes). But Noah continues to battle on the basketball court and remain the heart of the team even if his is broken. Noah committed a turnover trying to sneak a pass inside, but Khris Middleton rebounded an O.J. Mayo miss and traveled. Finally, the Bulls got the ball back to Dunleavy, who curled around a screen for a floater in the lane for a 77-72 Bulls lead with 2:39 left. Noah then pressured Knight outside and got back inside to block an Ilyasova second shot, the Bulls with rare deficits in rebounding overall and on the offensive boards. The Bucks also had a slight edge in second chance points, which the Bulls have lost just four times in the last 17 games. But the Bulls powering inside constantly—no one could make an outside shot, for one thing—had a 39-12 edge in free throw attempts. Though the Bulls missed 12. O.J. Mayo, who has become an expensive sixth man for the Bucks, missed on a drive, though he led Milwaukee with 16 points. 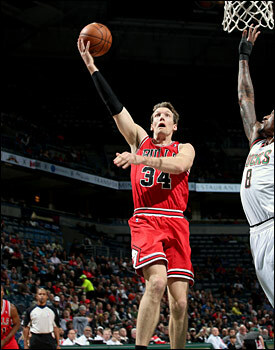 Dunleavy then made two free throws when he was fouled retrieving a Hinrich missed three with 1:16 left. At that point you knew the Bucks could not score seven points after having 13 all quarter. But the defense didn’t rest as Knight was harassed into two more misses for the Bulls eighth consecutive victory in Milwaukee. Once again, even more so now with the Bucks doing so poorly this season, it was a highly partisan Bulls crowd from Chicago’s northern suburbs, about an hour ride to Milwaukee. Perhaps more motivation from the out of town per diem. In any case, it was the Bulls the rest of the way. It was the 15th consecutive road game the Bulls have failed to score 100 points, the longest such streak in the league. The Bulls overall have scored more than 100 points just five times all season and just once in the last 17 games. They are now last in the league in scoring. But first in your hearts? It’s no secret to the Bulls as well that there aren’t many places to go for offense. So Thibodeau, who prefers a slower pace even when Rose was playing, has ground the team to a walk knowing there are few shooters. It’s basically Dunleavy and D.J. Augustin. Rookie Tony Snell has that ability and figures to play more. He played just 12 minutes Friday, and justifiably so as he repeatedly passed up open shots as Bucks defenders dropped off him and he still passed the ball. If you aren’t going to take open shots, you cannot be in the game. Snell played about four minutes in the second half with a trillion: That’s a number in minutes and nothing under any other category. But in going to Dunleavy, the Bulls got behind early. The Bucks play two point guards to start, a new fad the Suns have popularized. They had Knight defend the much taller Dunleavy. The Bulls tried to exploit the matchup early. But Dunleavy is not that type of player. He is more like Deng, working off his teammates. So in trying to force the ball to Dunleavy, the Bulls fell behind 10-1 to start and 16-5. The Bucks’ plan clearly was to push the ball for quick shots before the Bulls defense could set. 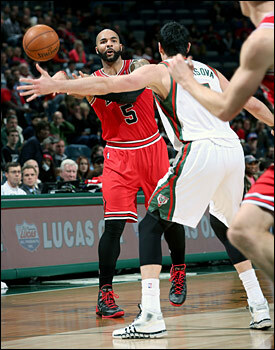 But the Bulls slowed it down and went to Boozer, who was a welcome sight being back. He rallied the Bulls back with nine first quarter points as the Bulls began the parade to the free throw line with 12 attempts. It looked bad when Gibson took a hard fall on his wrist and left going for a loose ball as the Bulls got back within 27-20 after one quarter. 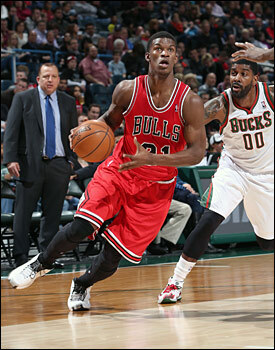 Gibson returned as the Bucks were, surprisingly, beating the Bulls to loose balls and offensive rebounds. But early in the second quarter Dunleavy and Augustin made back to back threes and the Bulls closed down the Bucks and took a 35-32 lead. The Bulls led 47-45 at halftime as Butler went out after being kneed in the thigh. He was questionable to return, but he did come back after halftime. The Bulls took control of the game in the third quarter. Butler hit a desperation three as the shot clock ran out, though the Bulls have plenty of practice shooting then. Erratic Larry Sanders drew a technical foul in a skirmish with Boozer, who just walked away smiling. Augustin added another three and the Bulls raced out to a 69-54 lead with under a minute left in the third. They would let the Bucks back in, though the Bucks, as you may have expected, stopped before getting there.